So...I guess I'll just start blabbering like I always do and maybe something decent will come out!?? We went back to the doctor today. 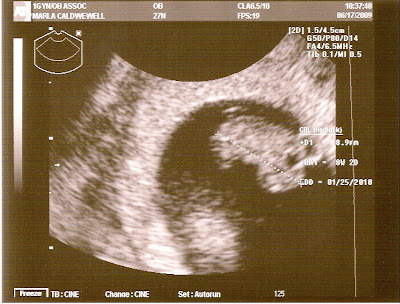 He wanted to do another sonogram to see the baby a little bigger. And a little bigger it is! 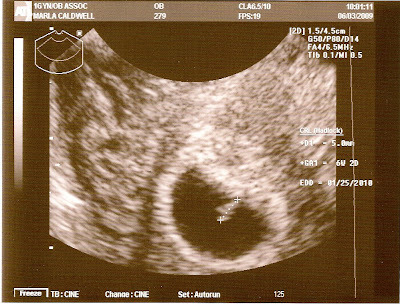 In the picture below...the baby is measuring at 18.9mm....so basically...in the past 2 weeks it has quadrupled its size. I know all of this is "normal"....but I still get excited about it...and am in pure amazement. The second time around, for me, has definitely been "different" thus far. But since that day 5 weeks ago when we found out...it has slowly but surely started setting in. This pregnancy has been a little different in that I haven't felt as good as I did with Parker...but at the same time...when I was pregnant with Parker...I wasn't chasing Parker around! Haha! I also don't get to sit around and daydream about my pregnancy and the baby that is growing inside of me as much as I did with Parker. how will life be with two?? I get excited about Parker having a sibling. I get excited about our family of 3 expanding to a family of 4. We talk about baby names every now and then. We wonder about what/who this baby will look like. When I was pregnant with Parker...I imagined a baby that looked like Geoff when he was as baby...now we can't imagine having a kid that doesn't look like Parker! But we also know it doesn't work that way...just fun to think about, I guess. We are so excited and feel so very blessed. We did tell Parker that she is going to have a baby brother or sister...and that there is a baby in Mommy's belly, but we know that she does not fully grasp this concept. However, she will point to my belly now on her own accord, at random times, and say, "Babee!" and then kiss my belly. It's pretty sweet. I think she's going to make a great big sister! I just started following your blog not too long ago. Congratulations!! I'm sure Parker is going to be an excellent big sister to baby #2! We congratulate you all! Parker is going to be a great big sister! It is very exciting! Parker will make a wonderful big sister!! She helps so much with Payton and is getting much practice so she will be ready for her new sibling!! I can't wait to meet my new niece or nephew!! That is SO exciting! The best part, you will be your most pregnant in the winter...I loved having Riley at the end of Dec! Parker will be such a good big sister...Ri-ee is a good name!! We are very happy for you! Congratulations on the new addition can't wait to meet my new grand baby! !